Following a series of disastrous dates and losing her job as a room attendant at a top London hotel, Ruby Penrose heads home to Cornwall. Her dreams of making it as a screenwriter failed and she has no idea what to do next. Reality TV star Jake Woodhouse was delighted to find a small, isolated Cornish cottage to rent for the holidays. He aims to spend his days there in peace and quiet, licking his wounds – his only company his faithful, but stubborn, British bulldog, Sherlock Bones. But as Ruby and Jake are drawn together by the magic of the festive season and the Little Cornish Gift Shop, they both begin to realise that sometimes it is possible to learn to trust again, and that friendship can be the most valuable Christmas gift of all. This is the first of three short stories in The Little Cornish Gift Shop series. Look out for Spring at The Little Cornish Gift Shop coming in 2019. Twenty-Eight-Year-old Ruby Penrose is fired from her cleaning job in a London hotel for something that wasn’t her fault, but feels that it is better she takes the blame than the pregnant single mother who is the real culprit. She has always wanted to be a writer and believes that she might now have the time to concentrate on the career she set out for. She grew up in Cornwall with her mum, who now lives in New York and her Nanna, Harriet who runs a gift shop. She decides that with nothing keeper her in London to head home, especially with Christmas just around the corner. Ex-reality TV star Jake Woodhouse is looking for a place to lay low for a while after a public break-up with his now ex-girlfriend. He’s fed up of the paparazzi following him everywhere and so settled for Bothlide Bay in Cornwall where he rents a cottage from the local owner of the gift shop – Ruby’s Nanna. Jake wants to keep his identity a secret so has grown a beard and started wearing his glasses rather than contact lenses. He also has the scruffy hair look going for him too. He is relieved when neither Harriet or Ruby watch much television and so don’t recognise him. But can he keep up the disguise forever? 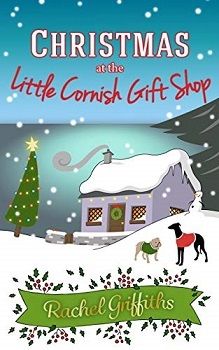 Christmas at the Little Cornish Gift Shop is an adorable, quick, heart-warming read that leaves you with that feel-good feeling. Join the villagers from a little town in Cornwall as they come together to get ready to celebrate Christmas. With Ruby back and a new face in town mores the merrier, especially when another ex-villager turns up at last minute. As well as the humans we also have two gorgeous canine cast members too – Amber the Greyhound and Sherlock Bones the English Bulldog. Both played a big part in the book and who doesn’t like a book with dogs in it! I read the story in less than two hours and in one sitting. The setting is simply wonderful and sounds so perfect, especially with a blanket of snow. Another fabulous book from Rachel Griffiths. As this is the first in a planned series, I now can’t wait to see what will happen to Ruby and Jake in book two, Spring at the Little Gift Shop, which comes out next year (2019). Sounds charming and a quick read that may help me get out of my holiday reading rut! Sherlck Bones, I love it! I know a great name. Ugh I’m in love with the cover. Glad you liked it. Great review! This sounds super fun and easy to read! I love Rachel’s books. Yes, another to add to my TBR list.